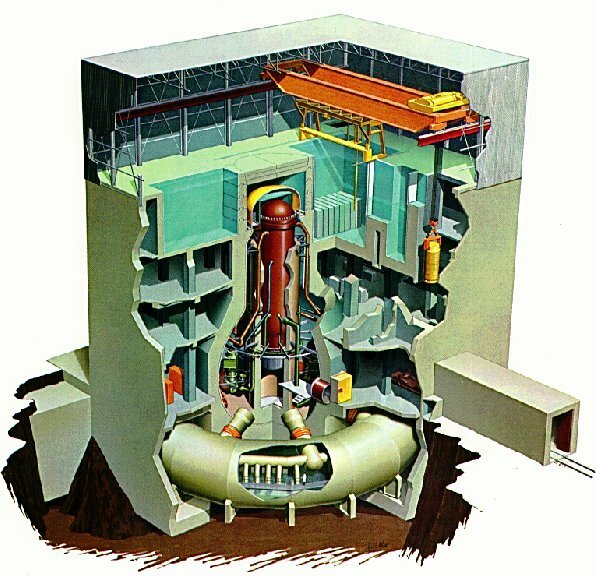 Containment or Drywell Building (graphic)- a building designed to sustain pressures of about 50 pounds per square inch. Normally houses the reactor and the related cooling system that contains highly radioactive fluids. Building is of steel construction. Sometimes the building is surrounded by a concrete structure that is designed for much lower pressures (3 pounds per square inch). The area between the steel and concrete building is called the annulus. Designs vary. At one facility there are 4 1/2 foot thick concrete walls reinforced with steel. The dome is 2 1/2 feet thick and the base 12 feet thick. The containment is the 3rd fission product barrier. In BWRs, the drywell is located in the reactor building. 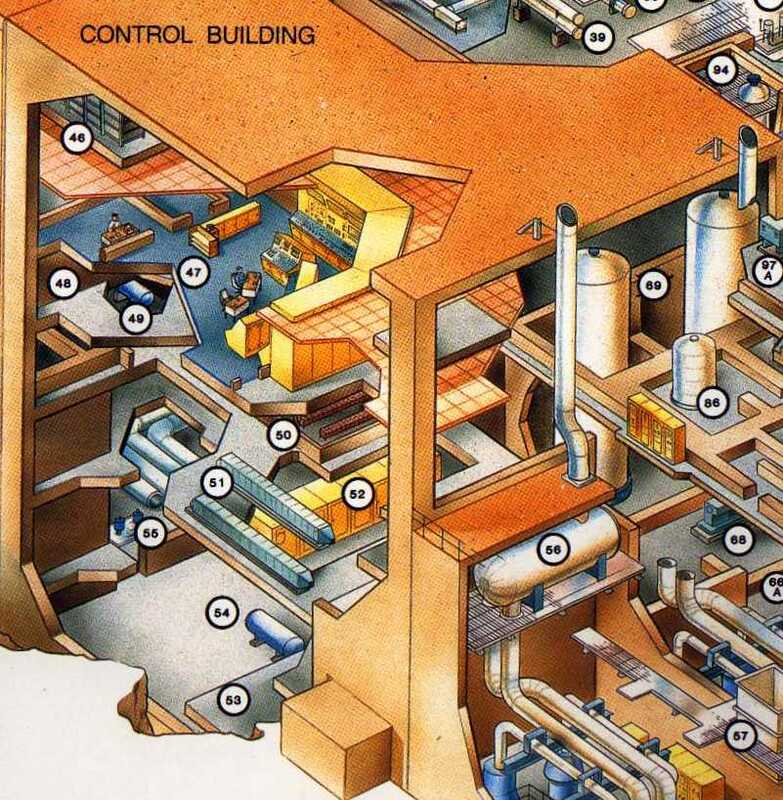 Auxiliary or Reactor Building (graphic1, graphic2- a building separate from the containment that houses much of the support equipment that may contain radioactive liquids and gases. Emergency equipment is also normally located in this building. 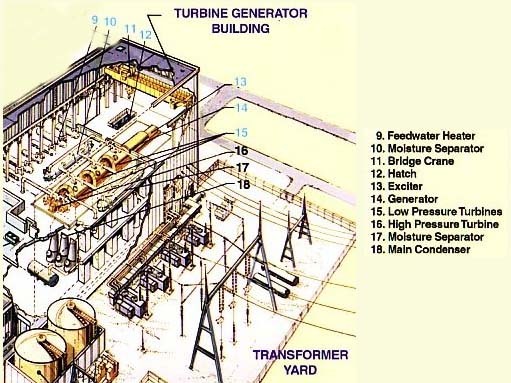 Turbine Building (graphic) - a building that houses the turbine, generator, condenser, condensate and feedwater systems. Some PWRs in the United States have a structure without the traditional roof and wall structure. These facilities are located in areas with milder climates as the Carolinas, Louisiana, and California. Examples are the Robinson plant in South Carolina, Waterford in Louisiana, and San Onofre in California. Intake Structure or Screenhouse - a building that houses the circulating water pumps used to pump water from the river, lake, sea for cooling the condenser. Trash racks and traveling screens also remove debris to clean the water so that it can pass through the condenser tubes. Fuel Building - a building separate from the containment that is used to spent fuel assemblies in steel racks in a large 40 foot deep storage pool. Casks for shipping or onsite dry storage of spent fuel assemblies will be loaded (or unloaded in this pool). 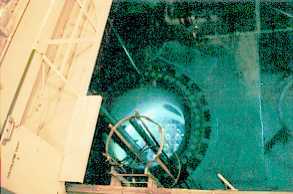 A new fuel storage area is provided for receipt of new assemblies and storage prior to going into the containment and subsequently into the reactor during a refueling. 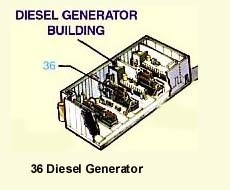 Diesel Generator Building (graphic)- a building used to house the diesel generators and supporting systems (air, water, radiator fans, fuel oil, lubricating oil, air conditioning, and ventilation). In some cases, related electrical switchgear for distributing electrical power produced by the diesel generator. The Diesel generators that provide backup electrical power to safety and non-safety systems. Water treatment systems used to purify water so that it can be used in the power plant. Radioactive waste treatment systems used to purify and store radioactive liquids and gases. Copyright © 1996-2005. Joseph Gonyeau, P.E.. The Virtual Nuclear Tourist. All rights reserved. Revised: December 8, 2005.